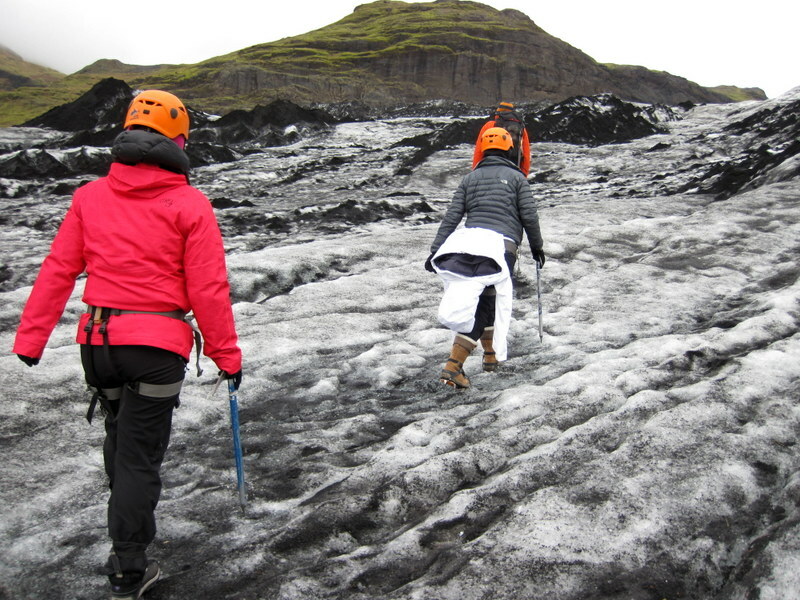 Hike a Glacier. Climb an Ice. For many years, they sounded like flights of fancy that I can only imagine myself doing. 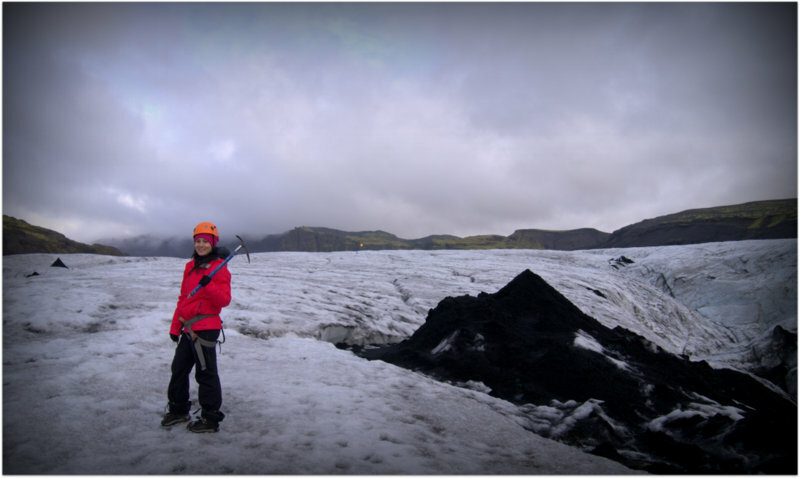 So when I knew we were actually going to Iceland, a place filled with, well, ICE and glaciers, I wasted no time searching and booking for a tour. 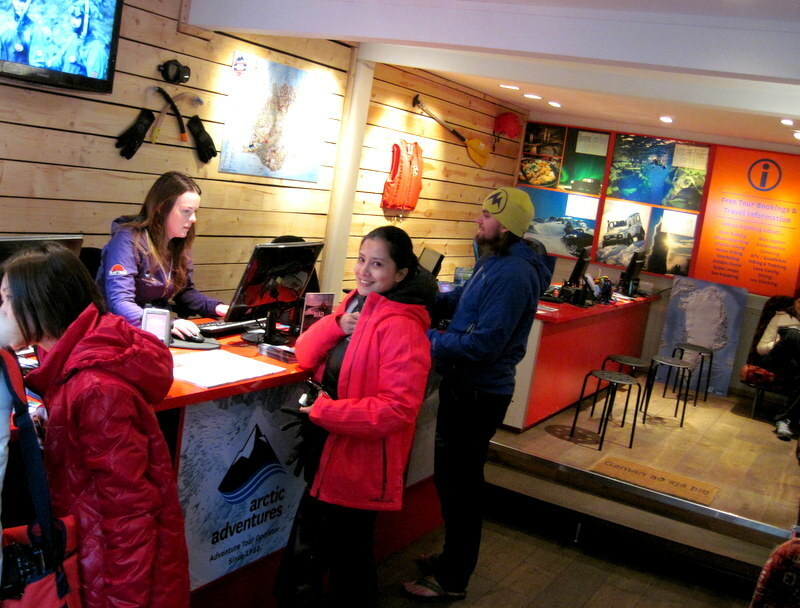 Booking with Arctic Adventures was a breeze. All communications from day 1 (of when I just inquired online) which was months before the trip until thousands of kilometers and hours later, when I finally set foot on their office- turnaround was very quick and someone always assured me that my trip/s are booked. 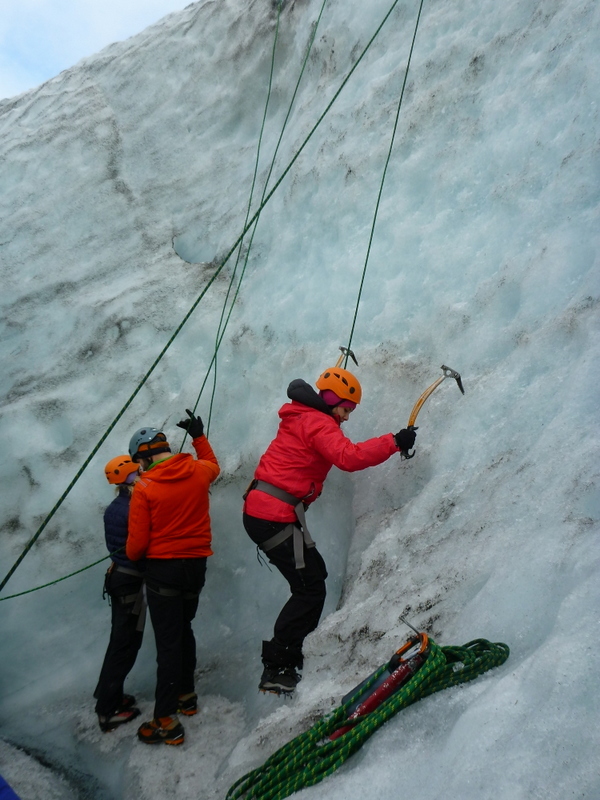 So when D-Day came, I was very excited to spend the day ice climbing and glacier hiking with them. They picked us up from our hotel promptly, and we drove about 40 minutes outside of Reykjavik. Our guide Dori, wasted no time in rounding up our group and thoroughly explained the safety guidelines as most of us haven’t done any of the 2 activities of the day. 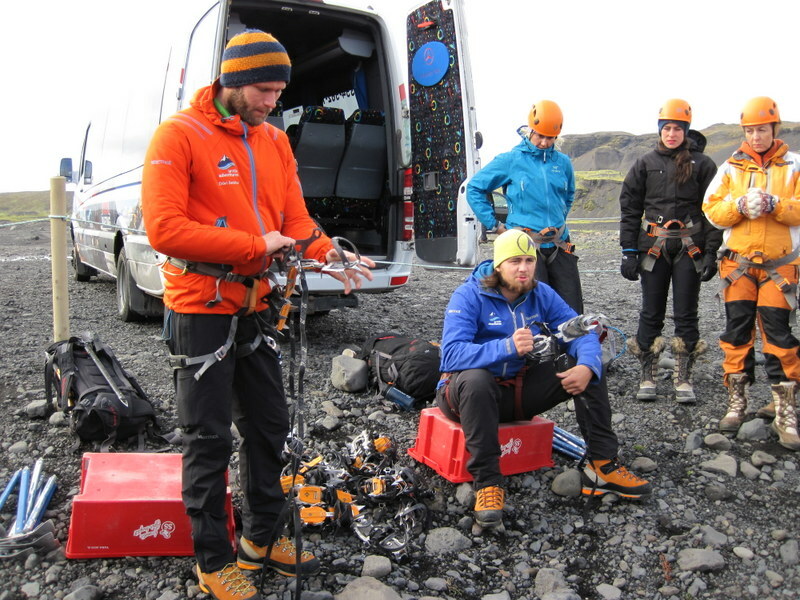 Most of all, he explained how to use CRAMPONS. 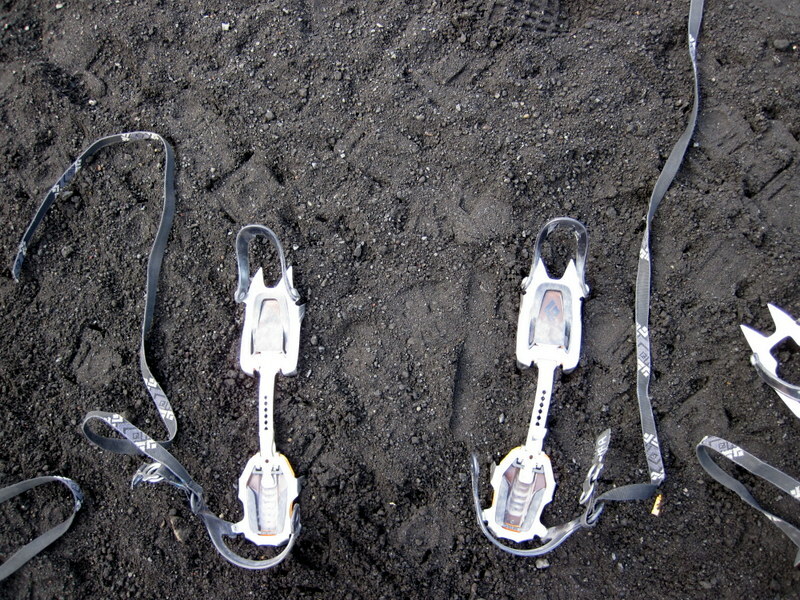 Going Ice climbing or hiking without crampons is akin to ice skating without skates. Yes, it is a necessary gear. 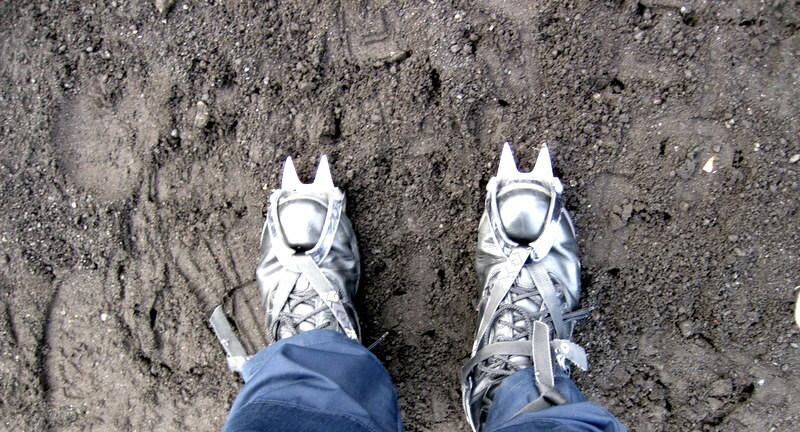 The sharp spikes will help you maintain grip and balance on ice. So without them you’d be slip and sliding all over the ice. Dori made sure all of us had perfect fitting and adjustments in our crampons. Crampons, check. Pickaxe, check. 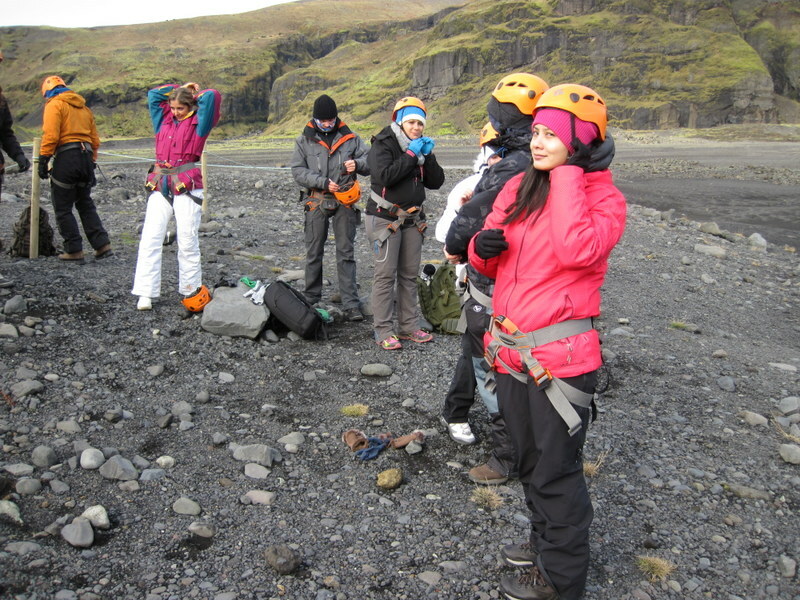 Ready to ice climb and glacier hike! We were soon climbing the glacier, and the first thing I noticed was the Crunch. Crunch. Crunching sounds everytime someone cleanly stepped on ice , with crampons digging the ice perfectly. It has this nice sound to it, that gives the same effect when you hear bubble packaging pop. 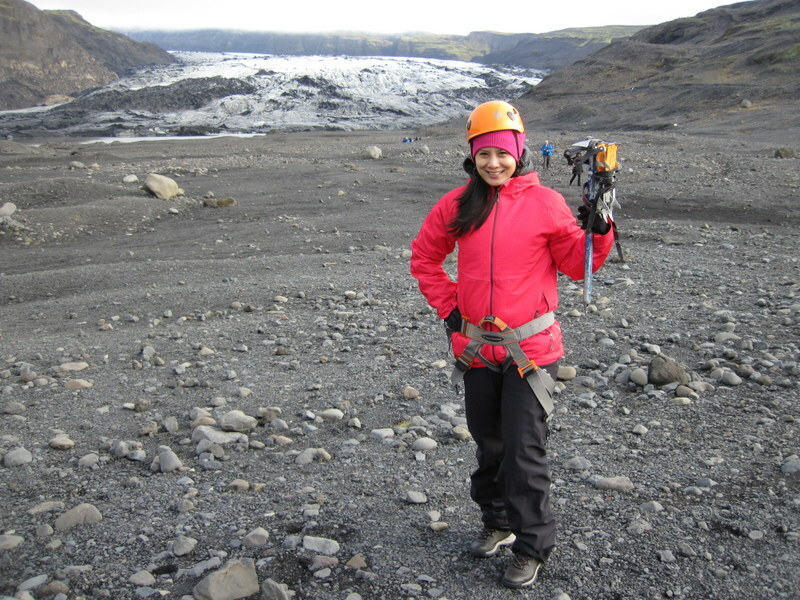 Glacier Hiking in Iceland. Don’t forget your crampons! Every so often we would stop around a moulin ( aka glacier mill). 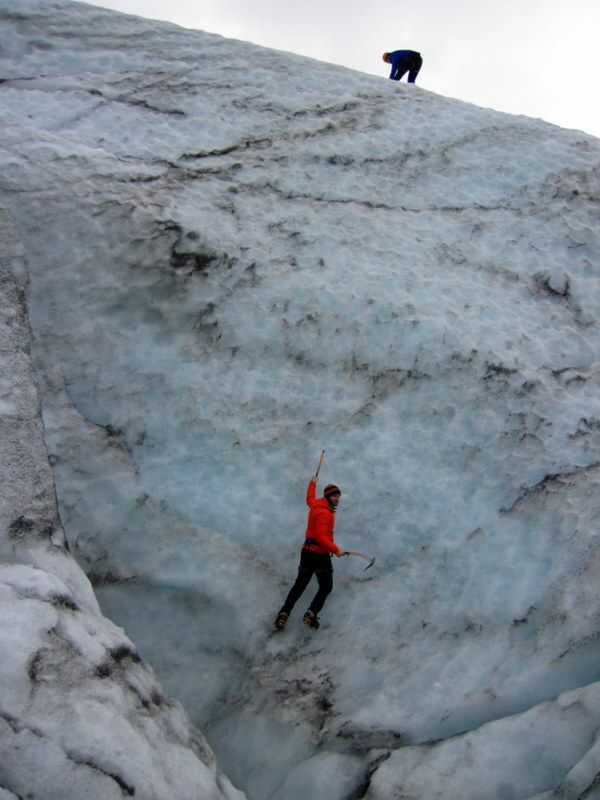 This is a vertical shaft in a glacier, formed by surface water percolating through a crack in the ice. 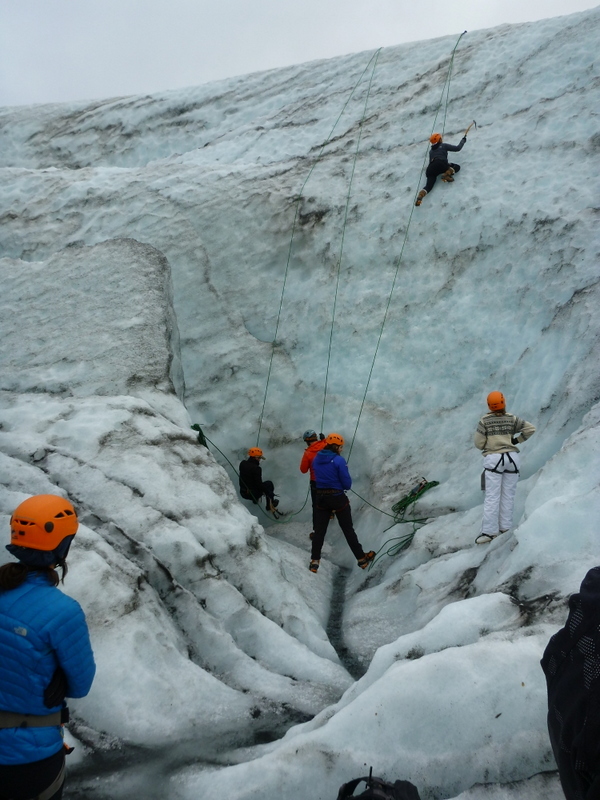 Dori also told us about the dangers of just gallivanting off on your own in a glacier. A number of people have , as I can imagine, just frolicked off then disappeared into the glacial ground. All of them were found, luckily, and were more dazed than hurt. 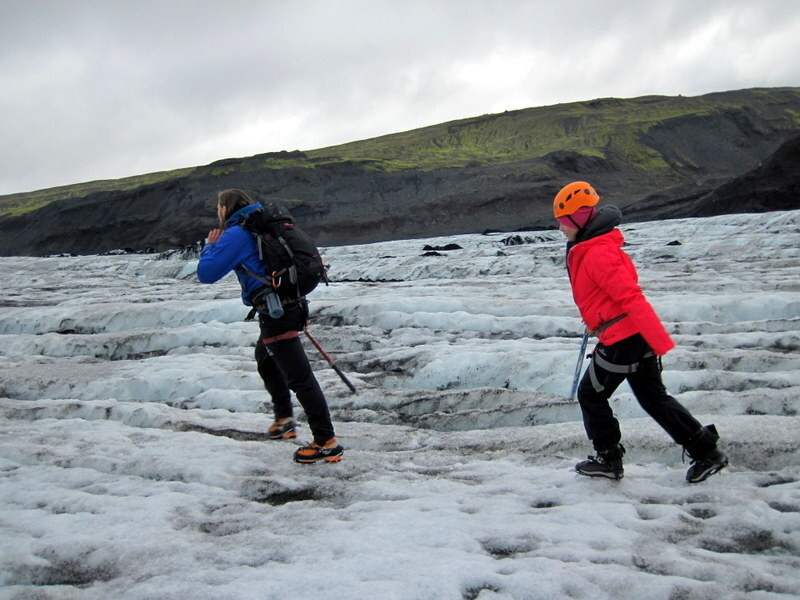 Now when Dori demonstrated climbing on ice, it looked real easy. Kind of like having super velcro attached to your arms. He even made sideway moves while in the ice. Surely this can’t be harder than rock climbing right? 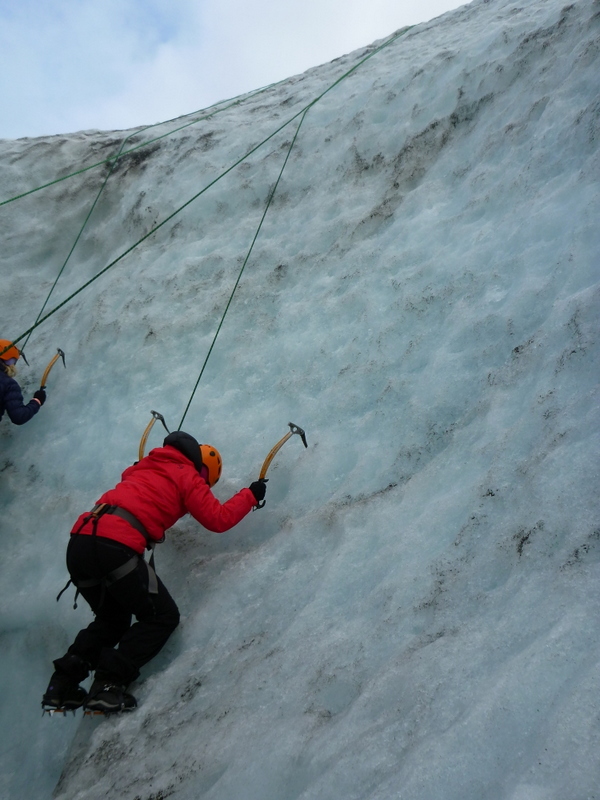 Ice Climbing in Iceland: It ain’t like rock climbing. HA. Ha. ha. This makes rock climbing seem like playing jack and stones! Well, for one, you need Double the strength. For the upper body/arms:1.) 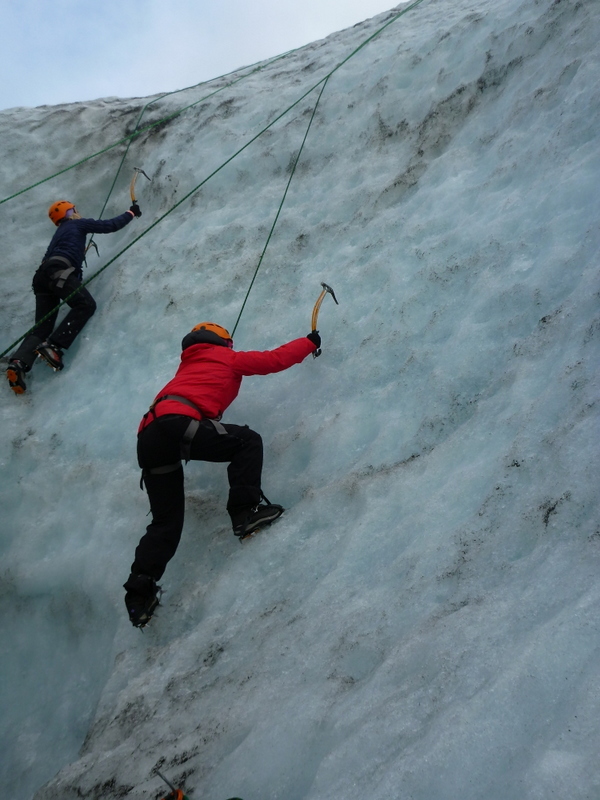 Strength to stab the ice with your pick axe strong enough for the blade to wedge cleanly, in order to 2.) hoist yourself up to the next level! AND 3.) the strength to GET THAT BLADE OUT of the ice once more, the repeat number 1. For your feet: Strength to use your toe and picks from the crampons to kick inwards and lodge your foot there, hoping it is stable enough to get yourself higher. It’s definitely an experience that I thought would be easier. But I’m so glad that we tried it. Because I know for sure that I will do it again! 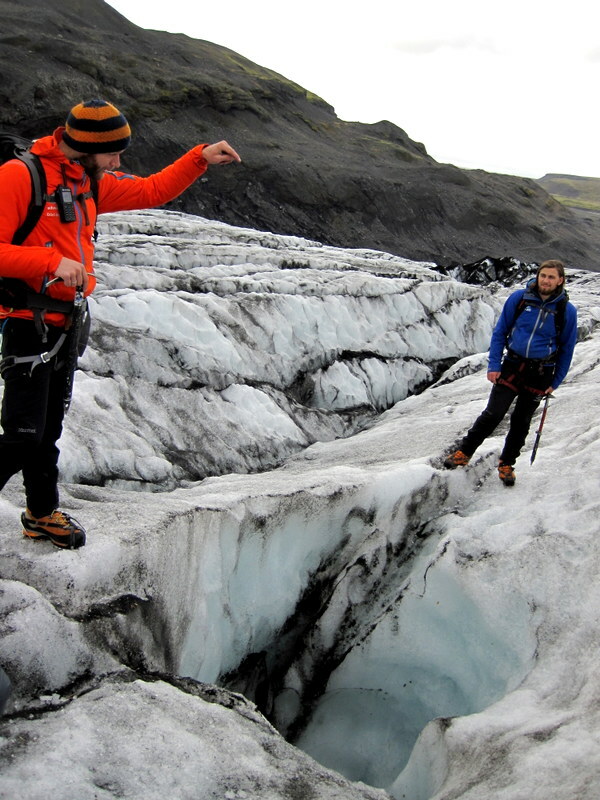 Disclaimer: Arctic Adventures kindly gave us a discounted rate for the Blue Ice tour.